When you’re an animation artist it’s important to get feedback on your work. After all, it’s said that in this business you’re only as good as your last movie. We have to keep improving and growing. Every project is a new challenge and adventure. As a storyboard artist at Walt Disney Feature Animation I asked my boss how I was doing. 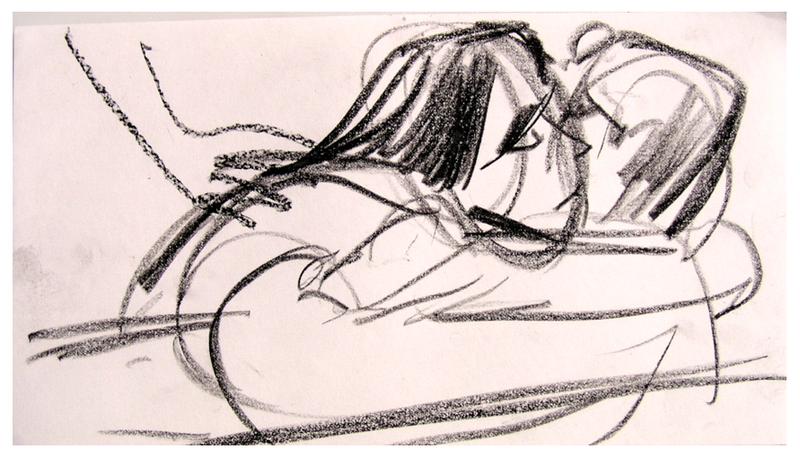 I was doing fine, but… sometimes my storyboards were, “emotionally cool”. This cut me to the quick. The heart and soul of filmmaking is emotions, and here I was being told my storyboards were unemotional. The meeting ended and I felt hurt. Then I felt angry. Then I made a decision. I could have shrugged it off, but instead, I used it as a learning opportunity. He was right, and I would correct it. It became my challenge. 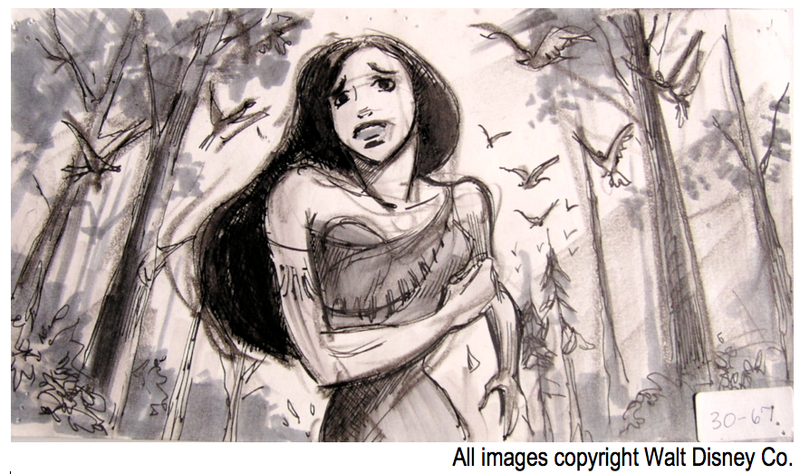 The first pass of Pocahontas’ farewell sequence was storyboarded directly from the script by an excellent Disney storyboard artist. As I mentioned, the sequence was about as exciting and heartfelt as the ending of a summer camp movie. 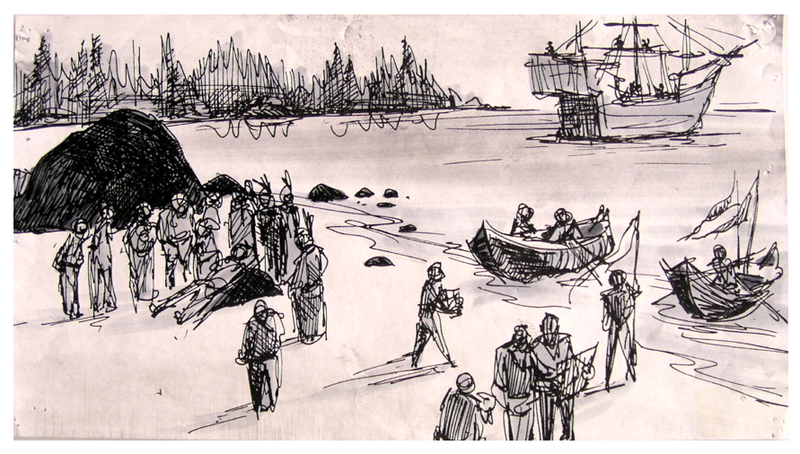 Everyone, including Pocahontas, was standing around the dock as they watch as John Smith and the ship leave for England. Pocahontas was supposed to be feeling loss and alone. The images telling the story never showed Pocahontas alone. How was the audience supposed to know how she felt? The images didn’t match the story we were trying to tell. What kind of movie were we making? Everyone thought we were making a tragedy to be modeled after Romeo and Juliet and West Side Story. I felt that Disney’s first sad ending could and should be so much more than the summer camp movie we had so far. (For the record, I like summer camp movies.) So I asked the directors, producer and the original storyboard artist for the opportunity to rework the sequence. What was the first thing I did? I got something to eat- for my brain. I started watching movies- every sad movie that I could find. 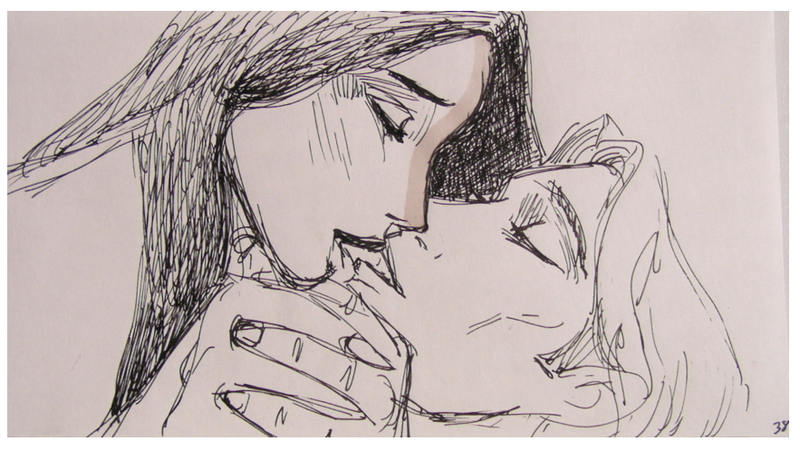 I watched various film versions of Romeo and Juliet, West Side Story, Ghost and many more. Then I watched a movie that helped me realize that they had the wrong paradigm for their movie. It’s wasn’t like Romeo and Juliet or West Side Story. We weren’t making a tragedy. Our paradigm was Casablanca! It was a bittersweet ending. We know that John Smith and Pocahontas love each other and that they will both survive, they just can’t be together for the greater good- just like Casablanca. Now I had a clear direction. My drawings had to tell this story. This also was my chance to prove my boss wrong that my story work was not “emotionally cool.” I called the sequence my heartfelt farewell. The characters need to feel sad but not tragic. They’re heroic. I thought about when I had left my home, friends and family in New York to come work for Disney Feature Animation in California. That was the feeling that had to go into the sequence -the sadness of leaving. However, something else was required to make it bittersweet. When I left New York, I was leaving for a great opportunity to fulfill my childhood dream of working on great Disney animated films. 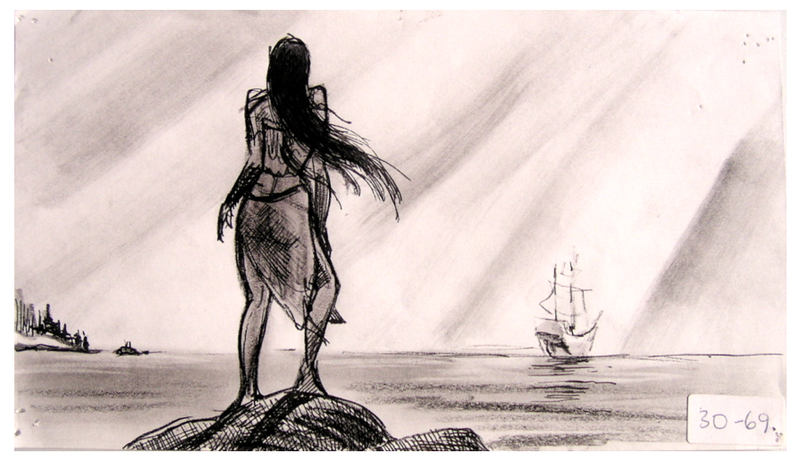 The most important point of the sequence is how alone Pocahontas feels. How do you show how someone’s feeling? Body language can say a lot. But what is body language? It’s the shape the body makes when one is feeling different emotions. Unless you’re a good poker player your emotions come through loud and clear. Doesn’t visual language work the same way? The answer is yes. This is the secret- every shape, line, composition has a feeling associated with it. In other words, shapes speak to us. They tell us how to feel. So the shapes of our composition can tell us how to feel. Composition is your visual subtext. The text is what happens in the story. When you tell a story there are always things that are not stated directly but indirectly by the structural elements like shapes, colors, composition and of course music. That is the subtext. Visual composition, or how the image is “structured”, provides this role. Position in the frame is part of this subtext and it can be used to reveal power relationships between characters. Images tell you what’s going on in the story, but just like the role of the music score, the compositional structure tells you how to “feel”. 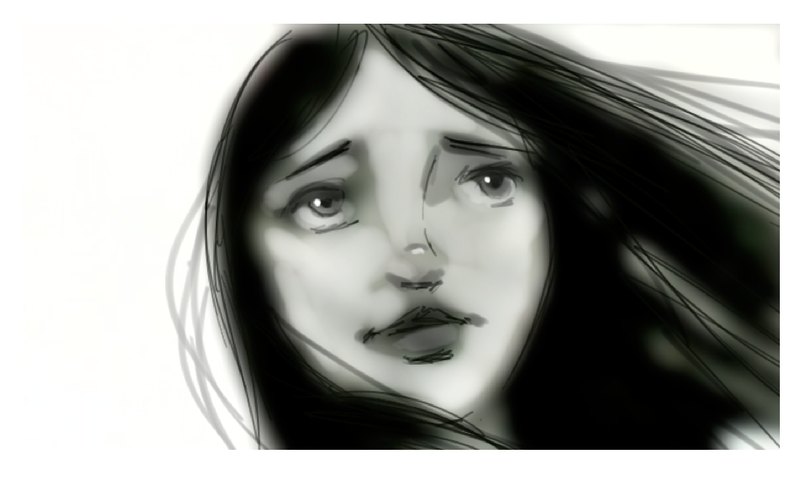 As an experiment, try to draw different emotions. But just use abstract images.Try scribbling or use cut out paper. What is truly surprising is how similar different people’s images are of each particular emotion. Anger is often represented but a jumble of jagged lines. Peacefulness is expressed with flowing horizontal lines. Think about this when you are this when you’re composing your shots. One more important function of the visual composition is that should be designed to show you where to look in the frame. It's a guide for the viewers eye to see what's important in the image. In the farewell sequence, I approached it in a shotgun fashion rather than a linear approach. I searched for key iconic images and then created the continuity flow around them. 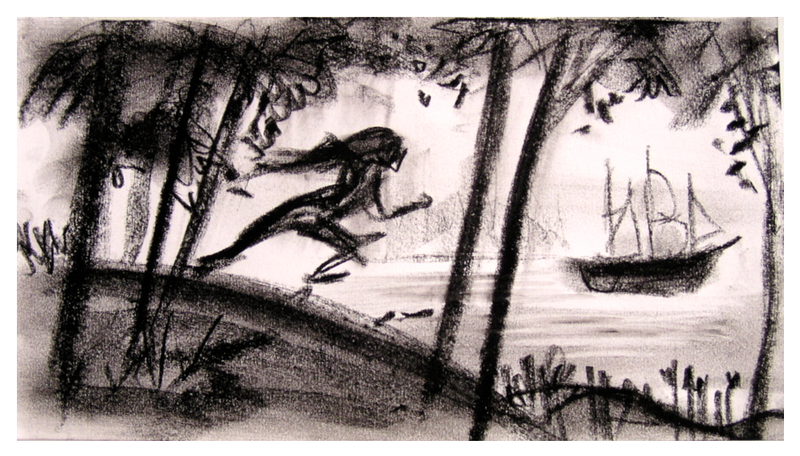 Thumbnail drawings were often drawn and redrawn many times to find just the right composition. Don’t be afraid to throw stuff away. Keep experimenting. It pays off. Don't stop exploring until it feels right. It's been said that all writing is rewriting. 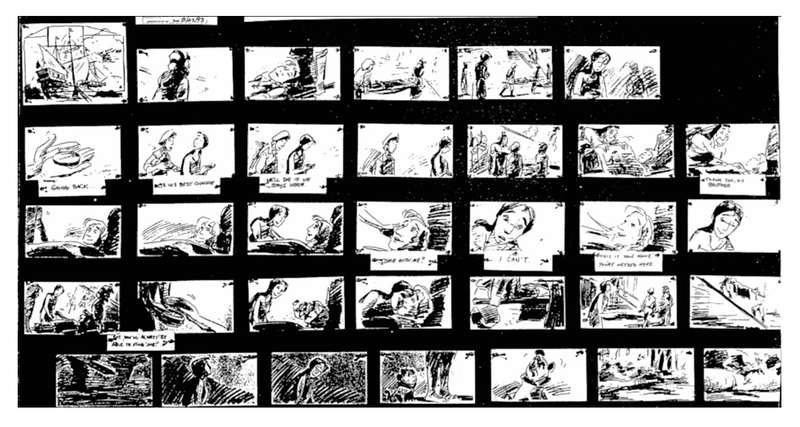 When the storyboard artist gets the script, they begin a translation from word to pictures. All storyboarding is re-storyboarding. It's a visual rewrite of the scene to make it clearer and more emotionally powerful. A dock isn’t big enough for the ending of this movie. I chose to show a vast expanse of beach with settlers preparing the ship for setting sail. I wanted a more desolate location. The weather also had to set the tone. A foggy morning hid things from view and thus feels mysterious. It also wouldn't work to have everyone there already. This cheats the audience of the tension the narrative question Smith is wondering, “Will she come?” This was missing from the first pass and helps build expectancy during the ending. Why not let the audience share in his feeling by not having her there at the start of the scene? This would make them feel more involved. The answer to the narrative question, “Will she come?”, is the arrival of Pocahontas. Like any Hollywood star, Pocahontas needed a big entrance. It should be a big deal that she’s arriving. 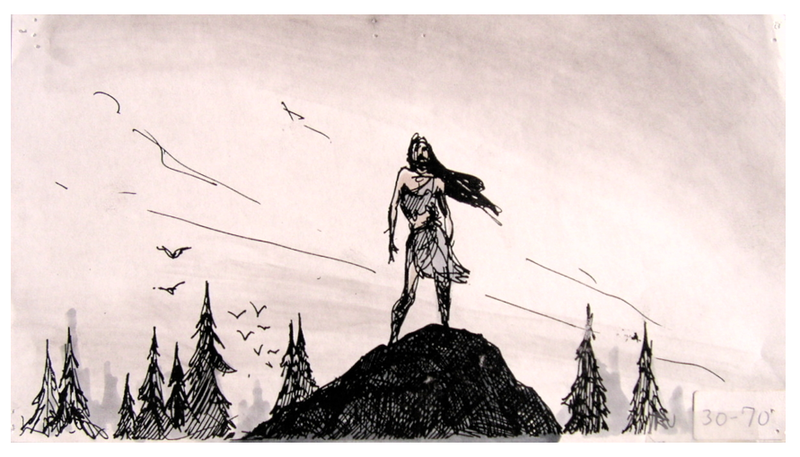 Emerging like a ghost through the fog, Pocahontas arrives leading her clan. They've brought food for the settlers thus visually showing the new peace that Pocahontas helped create. We also needed to show that everyone saw Pocahontas differently now. Whereas before, she was a "savage", now she was an Indian Princess. How do we show this difference visually? The men take off their hats and lower their eyes in her presence to show respect. The next narrative question is- will Pocahontas go with John Smith to England. Just as in life, decisions in movies are defining moments that reveal character. They should never be rushed or tossed aside. We need to see the character’s internal struggle. Pocahontas has to look around seeing the fragile peace that has emerged. She looks to her father for guidance. Pocahontas realizes she is needed to stay in Virginia to insure the peace. The good-bye scene itself must be pushed for all its worth. It is not a peck on the cheek moment. That might be fine for a summer camp movie but this is their first and possibly their last kiss. It has to be one of the most passionate kisses in film history, and it has to be close up. It is as if their souls are now one and should never be parted. The audience has been waiting for this. This also sets it up for the audience to feel the pain when they leave each other. But wait, there’s more. This moment needs to linger. How do you show they don’t want to leave each other? 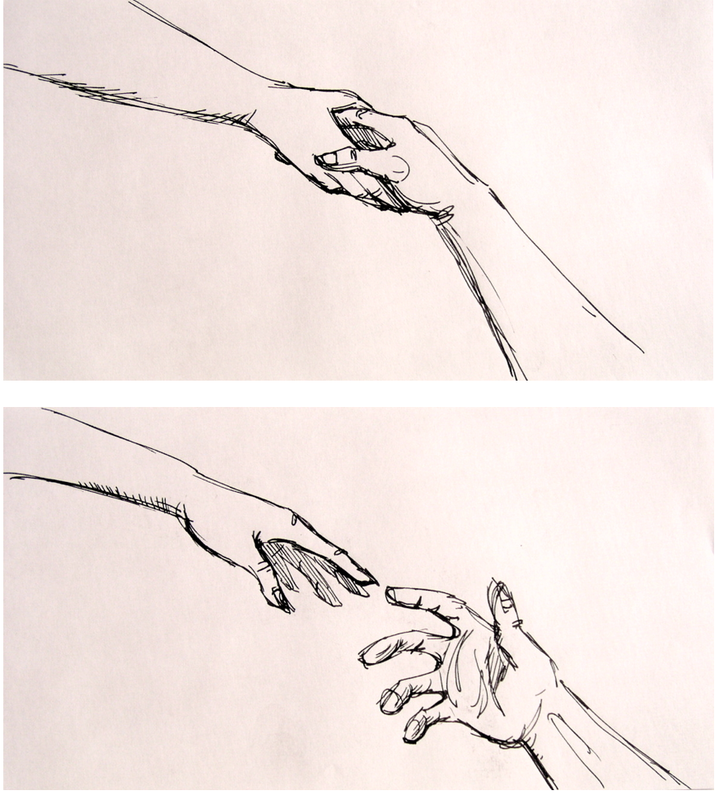 Their hands slowly painfully part. Remember, it’s all about story-delaying, making the audience wait for the answer to their questions. John Smith waves good-bye, but now he uses the Indian wave that Pocahontas taught him earlier in the film, it’s all the more poignant because when Pocahontas first showed him the wave it meant hello and goodbye. Ironically, he had said let's stick with “Hello” not “Goodbye”. 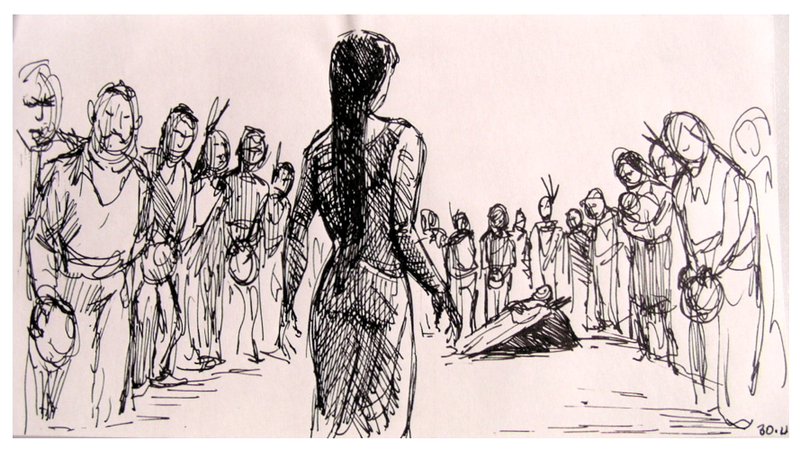 In order to convey how alone Pocahontas feels to the audience they must see her alone not surrounded by lots of people. She must be shown to alone in some way so I had her run to a peak to get a view of the ship sailing away. I thought about when I leave someone at the airport, I wait and watch their plane fly off, savoring that last moment of being with them. That’s what I had Pocahontas do. 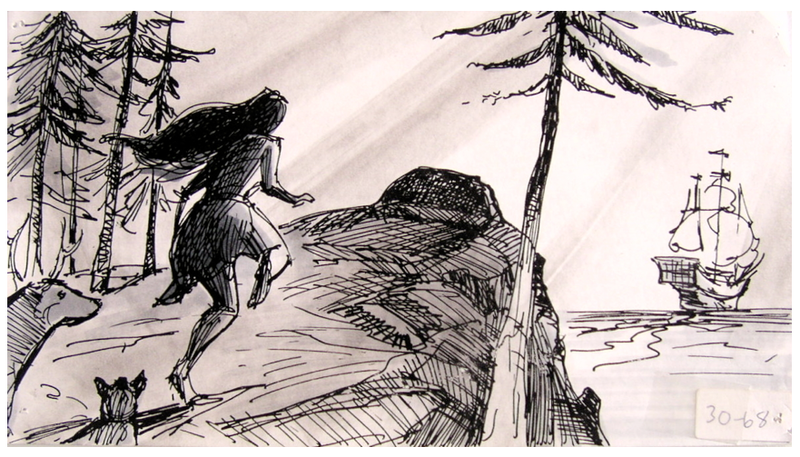 On her rocky peak, she watches as the ship disappears on the horizon. This shot shows Pocahontas as very alone, she alone occupies her position as peacekeeper. The shot shows her dominating the frame suggesting her nobility and strength. The music swells and the film ends. 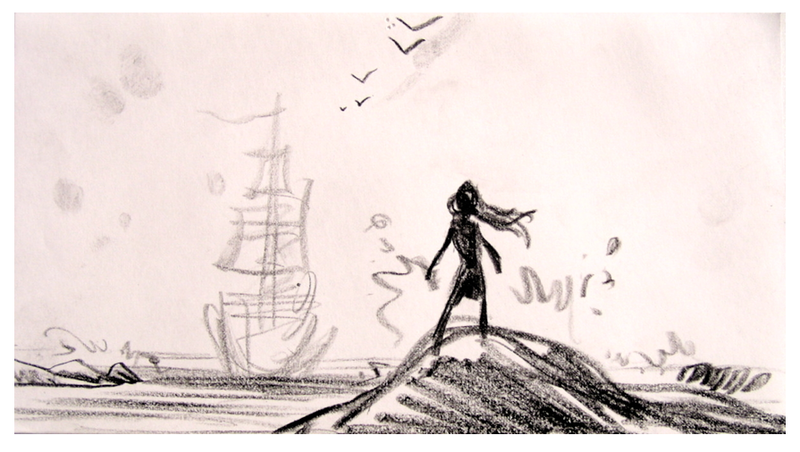 You can see the complete storyboard under the storyboard tab/Disney feature animation/Pocahontas farewell.